There are two connections of Redlands with the famous name of Suttons Seeds: one is that Broadoak House (now the home of St.Joseph's Convents School on the corner of Alexandra Road and Upper Redlands Road) was the family home of a member of the Sutton family, and the other is Alfred Sutton School was founded due the philanthropic benefaction of Alfred Sutton who gave money for its establishment and building. 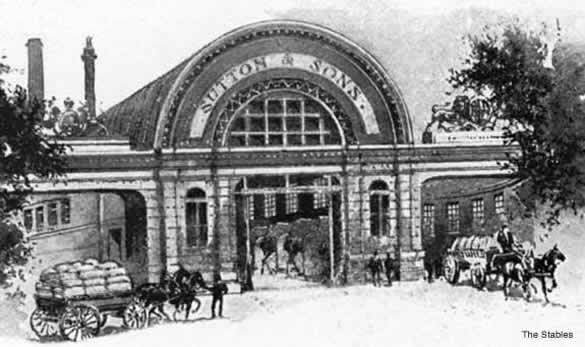 By the 1870s Sutton and Sons was the world’s largest seed firm, and was donating twenty percent of their substantial income to charitable causes. In Reading they subsidised the foundation of local schools, as well as large donations to churches. He set up Mildmay Hall which is today used by the Progress Theatre and gave his name to a variety of Rhododendron. He lived for a large part of his life in Cintra Lodge, in Whitley. On his walks to work along Watlington Street Sutton would sometimes encounter George Palmer, and they would often discuss the relative merits of their products. Alfred Sutton Primary School has served the community since 1902, as a result of both the rapid development of new houses built on either side of Wokingham Road and the Education Act of 1895 which made schooling free for all children. The school opened as Wokingham Road School with just over a hundred children attending on the first day. The school was built with some financial help from the Sutton family, of Sutton Seeds fame and in 1920 the school was renamed Alfred Sutton County School. Then as now, the school was very popular and pressure for places was acute. By the mid 1920s, there were 528 children in attendance, which meant there were about 50 to a class! During the 1960s and 1970s, the cultural life was broadened by the arrival of families from South Asia and the Caribbean, and the expansion of the nearby University of Reading brought visiting academics and their families to the area from many parts of the world. As a result the school developed the vibrant multiculturalism praised in recent reports following inspection of the school by the Office for Standards in Education (Ofsted) .